The end of a political era occurred tonight. The Hoboken mayor who looked like a shoe-in just months ago for a third term before backing out and attempting to insert Councilman Ravi Bhalla her successor, saw her legacy take a major hit before the City Council tonight. Mayor Zimmer's proposed Suez water contract wasn't dead-on-arrival; it was full-fledged roadkill. The proposed new water contract with Suez led to some aggressive council questions directed toward the administration and its consultants wanting to know how millions of dollars in bills could be hidden for years without anyone being told on the council as it accumulated. 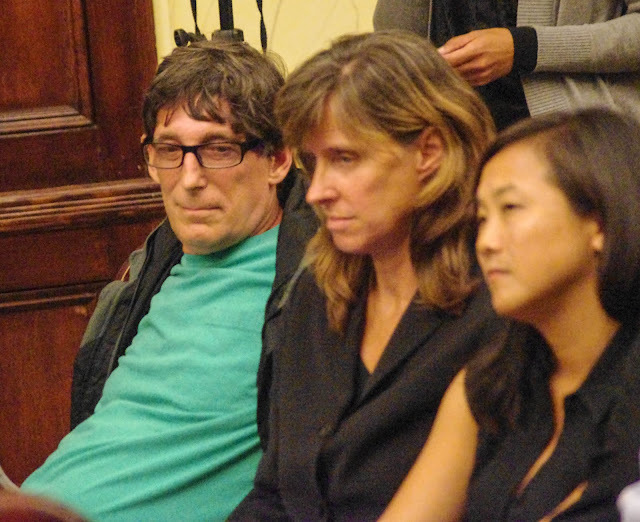 After her speech requesting the council vote and provide additional guidance on the Suez contract Mayor Dawn Zimmer put before them if rejected; the entire City Council responded in a calm, united fury with seething cold anger. Not for being placed in a position to vote without basic answers to a number of questions on the contract but also for the mayor's prepared political barbs against some of its members. They listened to her prepared remarks waiting to get answers not forthcoming to date on a $8.3 million bill owed Suez that appeared out of thin air. Various professionals and members of the administration hedged and punted to one another as the council members tried to get to the bottom of who knew about the accumulating million dollar bills owed Suez and when did they know it? Was it a year? Was it two months ago? The answers varied from professional to professional and only further outraged the council members who wanted to know why the million dollar liabilities were not being accounted for in this year's or any prior year's budget. City auditor Steve Wilcox said he had only learned of the massive seven figure debt yesterday. Flashbacks to how Hoboken found itself in a state takeover when Mayor Zimmer first became acting mayor back in the summer of 2009. More to come with Mayor Zimmer's prepared remarks and the council grilling the administration for answers. In the end, City Council President Jen Giattino asked her colleagues if anyone was sponsoring the contract. Seeing none, she assumed her authority as council chair and removed the Suez contract ordinance from the agenda. Not a single member of the council protested. Mayor Zimmer listens with her husband as Councilwoman Tiffanie Fisher delivered a stunning rebuke to her prepared remarks on the proposed Suez Water contract. Fisher's remarks would be echoed by almost every council member who sought answers on how over $8 million in red ink accumulated before coming to light owed Suez. Ravi Bhalla left the dais as he was recused from participation. Talking Ed Note: Councilman Ravi Bhalla left the dais and listened in the back of the room to the proceedings. He recused himself after questions about his partnership with law firm Florio Perucci came up last month. While not admitting to any conflict; he's clearly conflicted from participating. After what was seen tonight, one can view his recusal as perhaps a blessing. What was witnessed live and online was an implosion of Mayor Zimmer's mayoralty.